The Oil Rocks, 50km off the coast of Azerbaijan, is effectively a small city that has been constructed from interconnected oil platforms and residential areas, all sitting atop rocks, piles of sand and landfill. 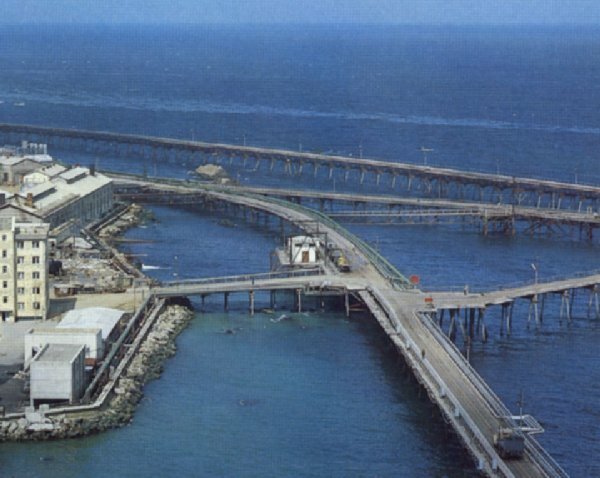 Back in 1949, the Oil Rocks were the site of the world’s first successful offshore venture in oil drilling, and by the 1960s 21 million tons of oil was being extracted each year. Of course, this level of extraction couldn’t continue forever, and the quality and quantity of the oil started falling in the 80s. With it, the upkeep of the platforms and interconnecting roads fell, and today about a third of the oil wells are either inoperative or inaccessible, and many of the connecting roads have become submerged. Despite the conditions, the platforms still have a combined population of about 5,000 men, who work in week-long offshore shifts, and collectively they produce over half of the total crude oil output of Azerbaijan. Several action sequences in the 1999 James Bond film The World Is Not Enough are set and filmed on the Oil Rocks, where terrorists used a giant helicopter saw to cut the oil pipes. Obviously. There’s a thorough history at window2baku.com, Wikipedia has a couple of choice facts, and there’s a photo of the interconnecting bridges at travel-images.com. Update: What we’re seeing here is actually not the Oil Rocks, but is very close. Oil Rocks is further out to sea, unfortunately in an low res area. You can get an idea of how big Oil Rocks really is from the OpenAerialMap image. Thanks to Samir Aliyev and Panda32 in the comments. The giant helicopter saws as shown in the movie actually exist, being used mostly for clearing power line rights of way.